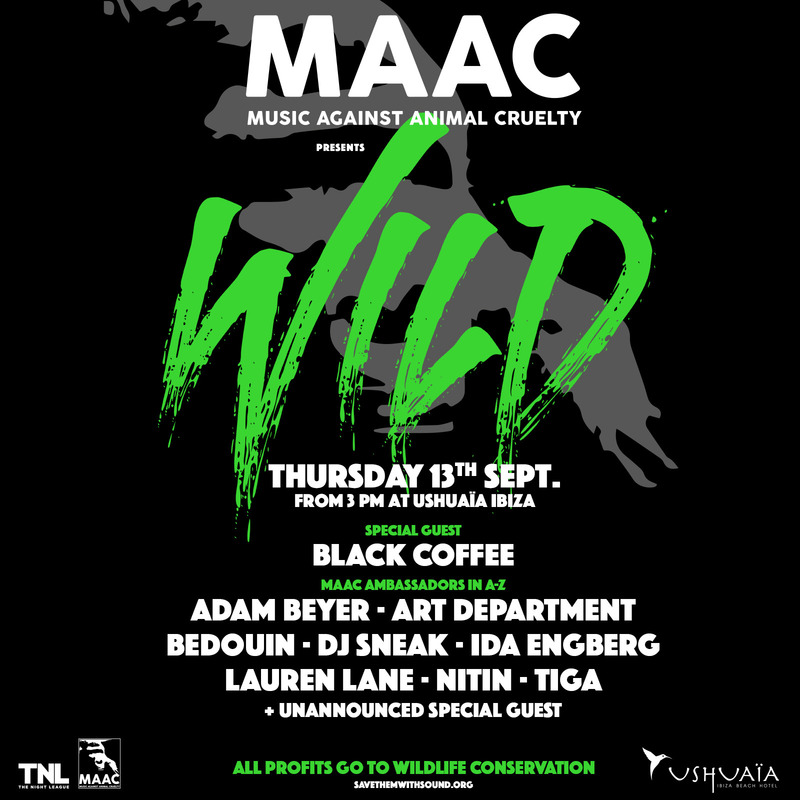 Ushuaïa Ibiza will host a charity event to help fight animal cruelty, featuring Adam Beyer, Art Department, Bedouin, DJ Sneak, Ida Engberg, Lauren Lane, Nitin, Tiga and an as-yet-unannounced special guest. The party, Wild, will also involve DJ Mag UK's August cover star, Black Coffee, and is set for Thursday 13th September at the famously hedonistic White Island hotel and venue. Promoters The Night League and Music Against Animal Cruelty (M.A.A.C.) are behind the session. Co-founded by Art Department's Jonny White earlier this year and with several ambassadors on the line-up, M.A.A.C. aims to raise much-needed revenue for conservation projects across the globe, and is currently focussed on two community-led initiatives— Rhino Conservation Botswana and Lion Guardians Kenya. 90% of the world's rhinos and 97% of all tigers have already been lost, with the illegal wildlife trade worth $15billion (US) annually and 20% of all species under threat of extinction in the next three decades. "This is gonna be a powerful movement when we realise its full potential. We need to be clear that this goes beyond just our community," said White. "This isn’t just techno against animal cruelty. This is music against it. This is a global force against treating animals like they have any less right to be here than we do. For now we’re looking to our sector of the industry for support as we build the foundation, but the bigger picture is garnering the support of the music industry at large."